After putting together this post, I was so anxious to see what outfit combinations I could come up with using black & white pieces from my own closet. I love the mod vibe of this particular pairing, plus the mixed prints & color-blocking create enough visual interest that it only needed one bright bauble to complete the look. THAT BAG! The black and white give it such crisp lines–I love it! as well as the one pop of yellow. Well styled. Loving black and white right now and this is a great take on it. I adore your bag…I looks super expensive. I was surprised to see that its Mossimo brand. Looking Good!! i can't believe you got that bag at target! well actually i can believe it, they have the best stuff! love this black and white look! LOVE it! and those shoes are SO cute! Wow, fabulous bag and shoes! Love this combo! I actually thought the striped top was a tie at first glance lol. The bag and shoes make it for me though. I love how you combined graphics and textures, and your shoes are to die for! Stop by whenever you like, it will make me happy! this is beautiful and simple! i love the bag! HOW AMAZING IS THAT BAG?WOW!!!! This is so striking and I love this trend! You look amazing! Love your outfit. Black and white is so classy! I LOVE the Mod look. I will also be using it this week. I think you've achieved it and you look amazing in it. this is really cool combination of designer clothes. I love the style with striped and polka dots. Another fab outfit! Love the the stripe and polka dot together! I love all the pattern mixing here! So cute! xo. Almost bought that bag at my local Target but the only one they had was damaged 🙁 Looks great! Love the black & white! This look is fantastic! 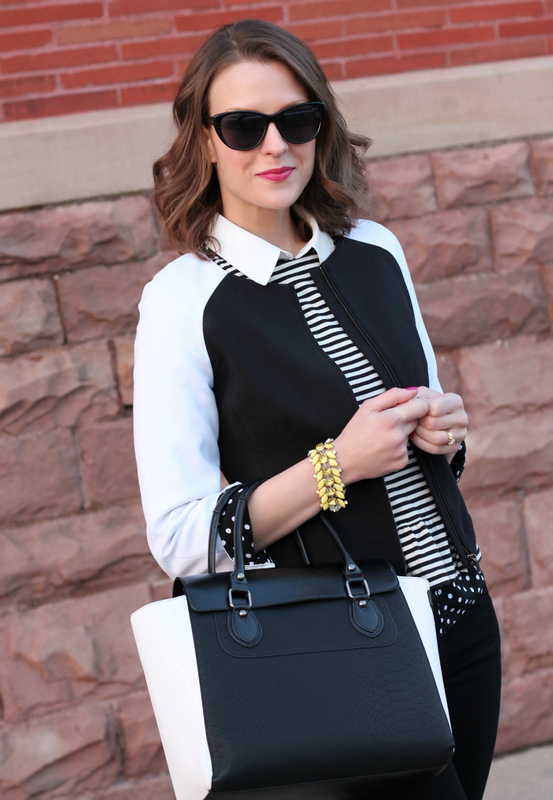 Love the stripe and dot combo, and so glad you were able to locate that bag! This is my kind of post lady! Black and white is such a classy look. I LOVE the mix of stripes and polka dots – such a great idea. This outfit doesn't quit, Kim! I LOVE that you rocked black and white – one of the most underrated combos in my book. Looks fab! I absolutely love black and white! Man, should I have picked up that bag when I saw two? So tempting! Really trying to restrict purchases but it's so pretty. LOVE, love this mod look, especially the layering under the peplum. Pretty! I love this look! Especially the shoes, they are so cute. You look adorable! 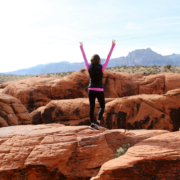 If you have the time I would love for you to stop by my blog and enter my giveaway! You went all out on this one. Great combination of black and white in different patterns. I cannot believe the bag is from Target! I love the layering of the shirts, it looks fabulous! LOVE this!! I have worn black and white SO much lately on my blog. I finally had to break in with some color. Love this because black and white is my all-time favorite combo. TERRIFIC b&w themed look…..great stylin as always!!! I am loving this black and white look! So chic! LOVE this monochromatic, pattern-mixing look, Kimberly. Black and white has always been my favorite, but in recent years I've been "encouraging" myself to wear more color. But I can't even begin to tell you how happy I am that it's "in" for Spring 2013. And this whole outfit is fabulous 🙂 So pulled together! I love this, the whole look is so clean and crisp! Especially with the addition of some playful pattern mixing!! LOVE the pattern mix! And that jacket! Edgy outfit! I simply love it! 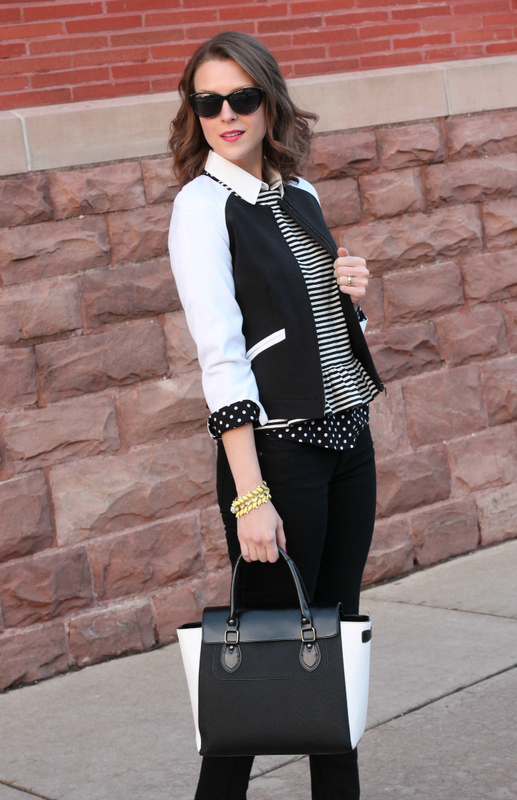 Loving everything about the black and white in this outfit! This looks great. Love the pops of polka dot under the striped peplum Kimberly! I love this look so much! SO into black and white right now! seriously loving the black and white trend, looks awesome on you! i can't believe that bag is Mossimo, you make it look so chic! Black and white is so now and you look absolutely stunning! one of my favorite outfits of yours! I'm loving the basic black + white combo right now and you look fab! Totally chic, and I love your print mixing! I love a good layered look and girl you did this well! Did you cut your hair? You keep getting shorter you might as well just Karlie Kloss it! That would look great on you! So cute. 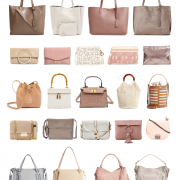 Love the Mossimo bag! Another terrific combination! I check your blog daily and because you are so classic and practical, I can adapt your wonderful looks to suit my age and what I have in my closet. thanks for the great inspiration! I am a huge fan of black & white and love how AT has a lot of that right now. Love how you paired the polka dot blouse under the peplum top! And your heels are to die for! You look gorg!! and I'm totally in LOVE with that bag!! Simply perfect – you look stunning. 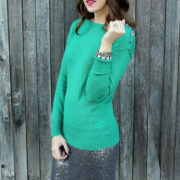 ohhh your style is so flawlessss!Do you want to follow each other on gfc and fb? Kiss from Norway! Amazing black and white look! I think you did it the best! 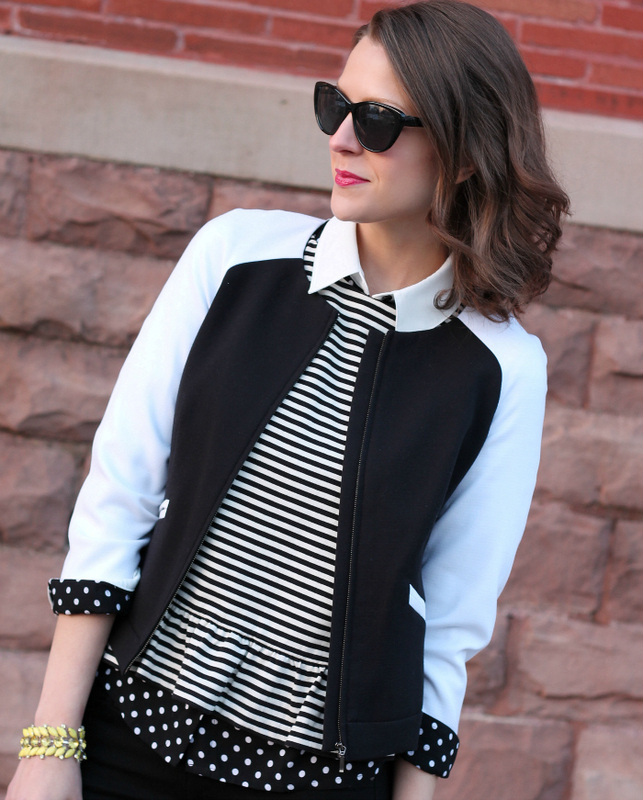 Rocking the black and white combo… plus polka AND stripes… Seriously, you are genius! Wow, the pattern mixing in this outfit is really cool and very well done. Love it! 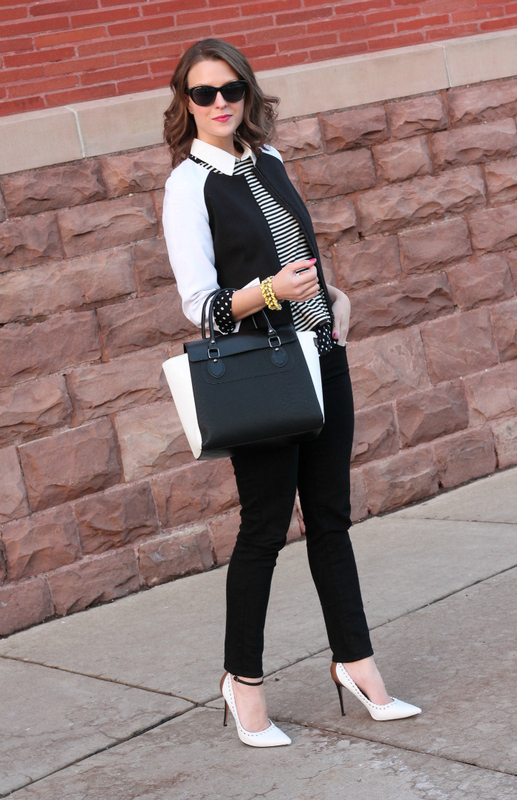 I'm a huge fan of graphic black & white, and this outfit is fabulous! And OMG I have to have that coat! Gorgeous!! !